When it comes to making the lights dance in sync with the music, Lightjams offers you a lot of creative options, all accessible in a few clicks. Real-time music analysis is perfect for improvisational music sessions when you can't just playback pre-recorded lighting effects. Are you using a DAW (Ableton Live, FL Studio, Reaper, etc.)? Then use the VST plugin to easily control Lightjams from your DAW. If you're looking for a music playback solution and being able to precisely sync light sequences, then the Lightjams music player is what you need. Here's new immersive sound and light system called Envelop. Lightjams generates lighting patterns in real-time based on the sound. Thanks to Scott Wood for letting me know about this project! The great Quixotic Fusion toured with Lightjams! Here's a video showing them using the music2lights feature to generate an interactive visual. The LED wall is composed of about 1100 RGB LEDs, all controlled by Lightjams. Quixotic also uses the OSC input features of Lightjams to remotely trigger effects. Alex Fancy built this music reactive LED floor. WS2812B LED strips have been used. Jordan Weir created this nice installation using 150 lanterns with WS2811 LED. Lightjams is driving everything based on the music. Select one of the 20 music frequency bands for a very precise music synchronization. In fact, Lightjams does a high quality 1024 band analysis and crunches the numbers to show you a handy 20 frequency band version. When you care about the music mood only, the overview offers you four frequency bands: overall, low, mid and hi. In addition, the blue lines show you the average power which is perfect to follow the musical mood. One-click beat detection! Just check the "beat" box and Lightjams will automatically detect beat amplitude for the selected frequency. It is not simply on and off but a full percentage value so you can know about the real beat power. Music from up to 8 inputs/sound cards can be fully analyzed in real time. It allows you to place sound recorders at different physical locations and trigger effects based on where it comes from. ASIO support for very low latency music input. For the real pros out there! Access the music configuration by going to View/Configuration. Sound cards: Lightjams automatically detects all your sound cards and sound input devices at startup. You can see here whether music is coming in and how loud it is. Hit the refresh button to detect newly added music inputs. Volume: The volume or gain slider lets you modulate the music input. This is handy to set the general music sensitivity without having to change all your project settings when the environment changes. Disable: You can disable music analysis by putting the volume to 0%. Although the analysis process isn't really CPU intensive, it may save some resources. Want to use the music you're playing right now with iTunes, Ableton Live or another player? 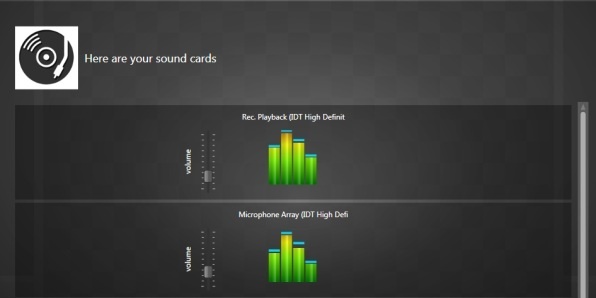 Most sound cards have a feature called sound loopback, playback or stereo mix allowing you to do just that. With Windows Vista/7 you may need to enable it in the sound control panel. To acces this panel, press the Windows key and type "sound". Select the Sound item. The panel looks like the image at the right. Go in the recording tab and right-click on the background. Check the "show disabled devices" option. You should now see a device called Stereo Mix or Rec. Playback. Right-click on it and enable it. 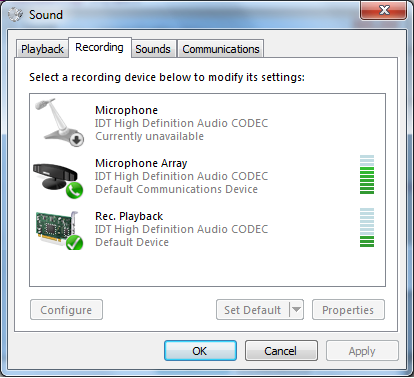 If your sound card doesn't have a loopback, activate the software Loopback (what u hear) option in Lightjams. Select any slider and click on the music icon. Then you'll be able to play with all music settings. Music analyser: The first thing you do is to select your music input. Here you see the eight buttons corresponding to your eight sound cards. Details or overview: Just click on the details or overview button to toggle between the two modes: 20 frequency bands or only the 4 overall bands. When using the overview mode, the first band is the overall and then you have the low, mid and hi frequency bands. Average: Check this box to follow the blue lines. These lines give you the average over time of the music levels. Beat detection: Check this box to use the beat detection mode. Link the master speed to the overall music level. Automatically activate lighting effects based on the music levels. Hi-hat triggers a strobe effect? Quick & easy way to animate LED panels with music. Perfect for live music improvisation. Allow non-scripted music event to still be able to be synced with lights.